Some of the many stunning beaches of the South Coast, historic townships, beautiful lakes, waterways and lush hinterlands. Some good places on the South Coast to find accommodation such as hotels include Kiama, Nowra, Batemens Bay and Ulladulla. Omaderry, Shellharbour, Jamberoo, Park, Minnamurra Rainforest, Shoalhaven, Jervis Bay, Berry, Milton, Ulladulla, Mollymook and Narrawallee are other options. 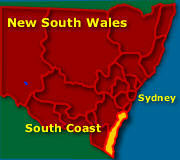 The map shows South Coast Towns, State and National Parks, and places to see - South Coast Map NSW. The Cronulla Peninsula, located on the the south side of Botany Bay has four main beaches. Wanda Beach, Elouera Beach, North Cronulla, South Cronulla and Shelly Beach. Cronulla is accessible by train from the city and close to four National Parks, making it a good place to stay while you explore the rest of Sydney. See more about the Cronulla Beaches. Places to enjoy beachside accommodation can be found in the many beachside suburbs of Sydney, but the most popular places to stay are Bondi, Manly (North Shore), Coogee and Cronulla.